The lobby of the school has toys and a play kitchen, which Ruby got right into, and then indeed became the kid crying and raising a stink when others started playing and then she was asked to go upstairs with her teacher. I lingered in the park over my (actually supreme everything and olive) bagel and coffee for ten minutes too long, and returned to my one-hour muni-meter parking spot to find a little orange love note tucked onto my windshield. Between Tal Bagels and Tang Tang Noodles, I spent most of the day hunkering down with my old-time Upper East Side favorites. 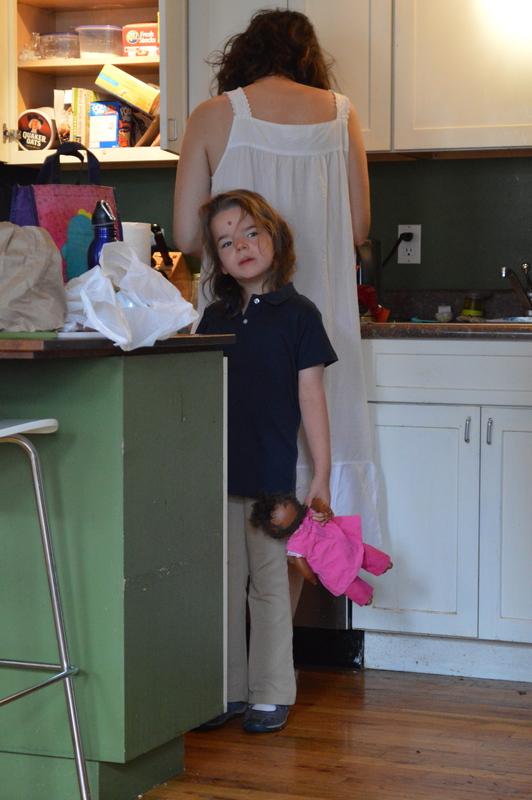 This might happen often if Ruby doesn’t start riding the school bus soon. But I returned to school mid-day to spy on her in their nifty observation booth, equipped with a one-way window into the classroom. 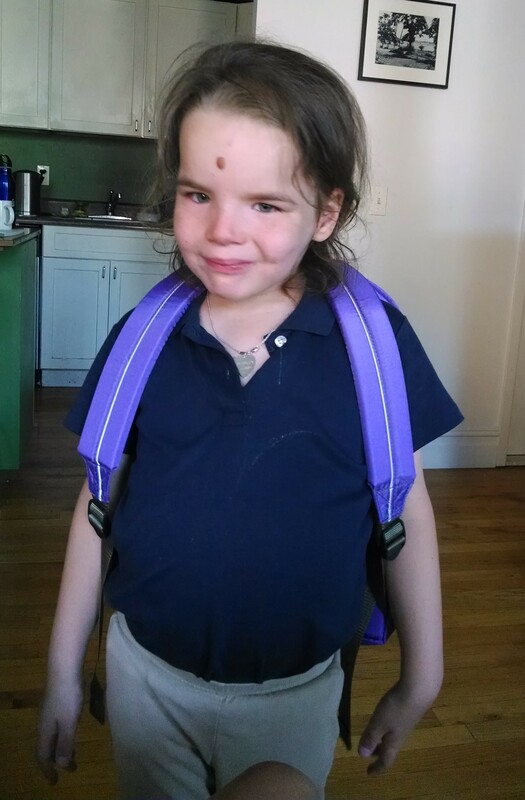 The speech teacher told me Ruby had been crying a lot — short bouts of crying whenever they transitioned to something new, easily consolable and redirected — and that she thought this was because Ruby didn’t know what was going to happen next, didn’t know what was expected of her. Which sounds right. When I got there a few hours in, though, she seemed settled, and I watched the Language Arts lesson, in which the teacher sat at a table with four children, reading them a book about a camping trip. This lesson underscored the reasons why this school is appropriate for Ruby. Each child was within touching distance of the teacher and the book, and another teacher hovered around redirecting distracted eyes and bodies and assisting the two children there who were using AAC devices. The teacher talked about the book’s vocabulary, all of which was basic for your average six year old (turtle, tent, camp fire, sleeping bag) but most of which is not in Ruby’s repertoire — certainly not in terms of speaking, and most likely not in terms of comprehension. So they talked about the words, describing what they meant, having the children try speaking them, associating movements with the new words (zip up your sleeping bag! ), and the teacher asked questions about the book to each of the children, and each response was acknowledged. Afterwards, they did a short, related craft activity, building a pretend campfire with yarn and paper. The speech teacher told me that in Language Arts, the class reads the same book throughout a week, so that they can absorb the vocabulary and build up their interactions with and thoughts about the story. Compared with Ruby’s old school and despite the fact that she was in a lovely integrated classroom with excellent teachers and a devoted para (a one-to-one aide in NYC public school lingo), this is 100% more Ruby’s speed, and it seems clear she will be able to learn significantly more this way. While that larger classroom sometimes broke into groups for work and gave Ruby as much individualized attention as possible, they simply didn’t have the staffing to do it all the time, plus, none of the other children needed to concentrate on the same things that Ruby needs to concentrate on. I often saw the end of story-time when I picked Ruby up, and with twenty-five children sitting on a carpet listening to a teacher read a book, eagerly raising their hands or spurting out answers to the teacher’s questions, the most I could hope for was that Ruby stayed seated and lent an ear to what she was hearing. Granted “story-time” was probably meant to be more casual than this school’s Language Arts lesson, but still…this is right. The slight worry that I felt about going ahead with this school (and the legal/financial/bureaucratic challenges this brings) largely because of my gut reaction on two brief visits, and about transitioning Ruby’s education yet again to a new, unfamiliar set of teachers and therapists, dissipated as I watched the lesson. When we left Ruby was whiny again, but she passed out as soon as we got in the car, exhausted. 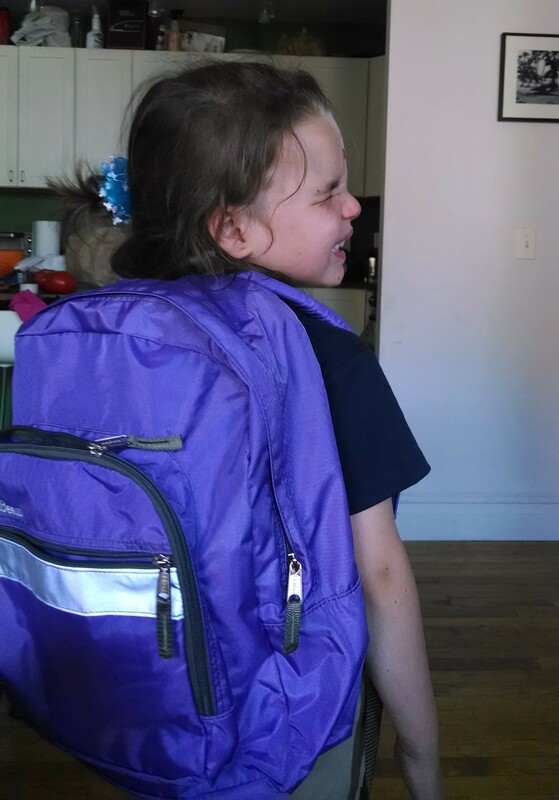 She was revived when we got home and discovered that her new backpack and lunch box had arrived, and over the next couple hours I realized that school had made a deep impression on her. She kept her backpack on and talked about going back to school, and then she insisted that I draw school. Ruby is quite inconsistent when it comes to talking — sometimes it’s, wow, this is so cool! and at other times it’s, wait a minute, aren’t you supposed to be starting to talk now or something? — but she was on fire last night. I got her into bed early because she was just about falling apart, falling asleep on the toilet, but she still paid rapt attention to three books, and then she actually had trouble falling asleep, which is quite rare for her. She reminded me of me, overstimulated and buzzing with thoughts and impressions to process the night after beginning a new chapter. That program sounds so awesome! We used to have one like it here in Denver, but funding issues caused it to be discontinued. Sounds like it will be great for you daughter.